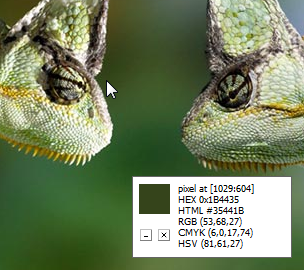 Pixie is an awesome little color picker tool that everyone should have. Run it and it shows up as a tiny window that can be dragged and placed anywhere on the display. Hover your mouse cursor over anything on the display and the Pixie window will display the color values of the pixel currently underneath the cursor. It is very useful to capture colors from anything that is on your display: windows, images, photos, applications or webpages.